Every year my sister hosts Rosh Hashanah at her house and asks me to bring my kale salad (the one with pomegranates, you guys know it well), and another side. I am only too happy to oblige, especially considering that she is in charge of the brisket and, you know, hosting thirteen of us. The kale salad is a no-brainer, as I’ve mentioned many times, it’s the kind of thing that seems to work just as well for a regular old Wednesday night rush-fest as it does for a table set with linens, china, and a shofar centerpiece. For the other side dish, though, my brain always heads in some sort of herby quinoa or tabbouleh-type direction. Maybe feta. Maybe parsley. It feels safe and healthy, and plays nicely with the brisket, especially when some of the brisket sauce swims over to mingle with the grains. And its Mediterranean note feels right on the Rosh Hashanah table. The problem with those salads though? They’re not terribly exciting. They’re….sensible. At least the way I make them. Everyone will pile some on to the plate, and later not really remember anything about what they ate. Last week, I wanted to try something new, break out of my own grain salad rut and attempt something that didn’t feel like homework, maybe even something that people would remember. Not surprisingly, I found what I was looking for in the first book I pulled off the shelf: Leah Koenig’s Modern Jewish Kitchen. (You might have already tried her super simple Roast Chicken with Fennel and Oranges that I featured a few years ago. And if you haven’t, you should right away.) 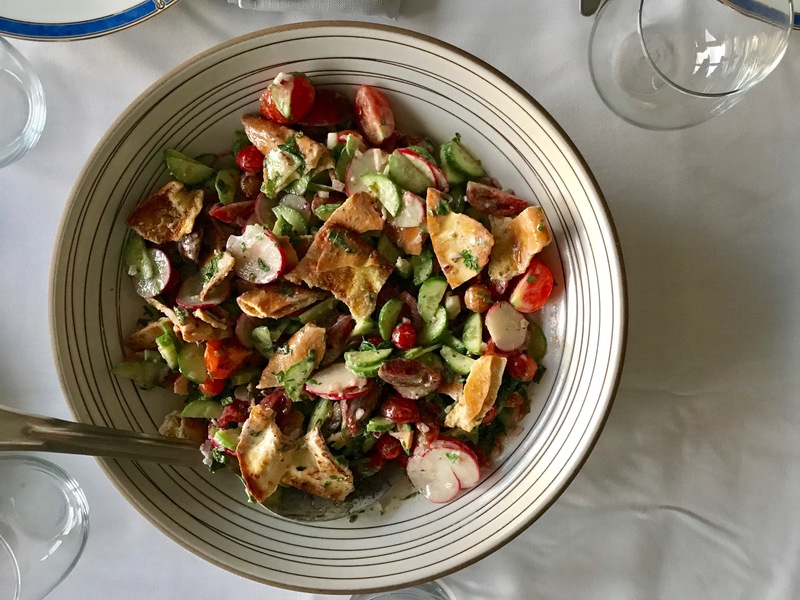 I found Fattoush, which, for those of you who don’t know, is like the Lebanese cousin of Panzanella. Lots of vegetables and herbs, mixed with a lemony-yogurt za’atar-spiked dressing, crispy pita chips, and — here’s the rub — really good tomatoes. Since the window for tomatoes is about to shut for good, I was so happy to have an excuse to use a pint I picked up at our farmer’s market plus a few spares I rescued from my sister’s backyard garden. Speaking of dishes people get excited about, I also filled a casserole with creamy, buttery horseradish mashed potatoes and the kids and their cousins, who usually only see this dish on Thanksgiving, couldn’t believe their luck. What they didn’t know was that the mashed potatoes were a decoy, meant to distract them from the fattoush so there would be enough for the grown-ups. It worked. The bowl was licked clean, but we had plenty (for seven adults) and the next day my mom emailed me for the recipe because she wanted to pass it along to her tennis partner who was cooking for a crowd later in the week. That’s how I know it was a winner. Just add a Roast Chicken to make this a full meal. Preheat the oven to 400°F. Lay the pitas on a large rimmed baking sheet and bake until dry and crisp, about 15 minutes. Remove from the oven and let cool completely, then break into bite-size pieces. Transfer to a bowl, drizzle with 2 tablespoons of the olive oil, and stir to coat. Whisk together the remaining 2 tablespoons olive oil, yogurt, sumac (or za’atar), lemon juice, garlic, salt, and pepper in a small bowl. In a large bowl, stir together the remaining ingredients. Fold in the toasted pita pieces. Drizzle the dressing over the top and gently toss to combine. Divide the salad among the plates and serve immediately. 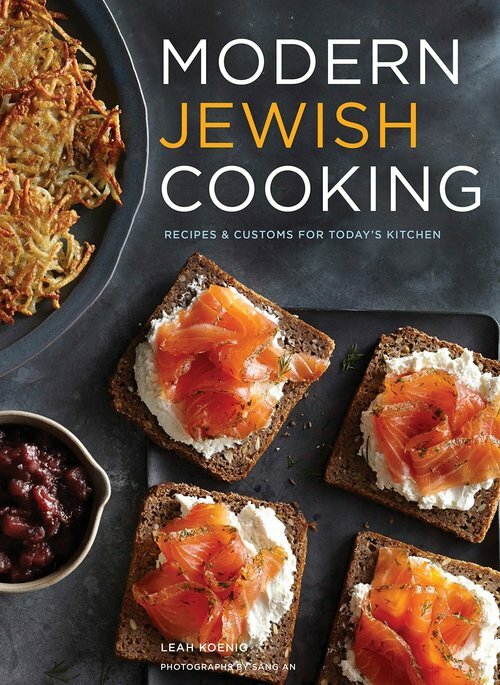 So many more where this one came from in Modern Jewish Cooking. For more Leah, check out her website, or follow her on instagram. Recipe reprinted with author’s permission. 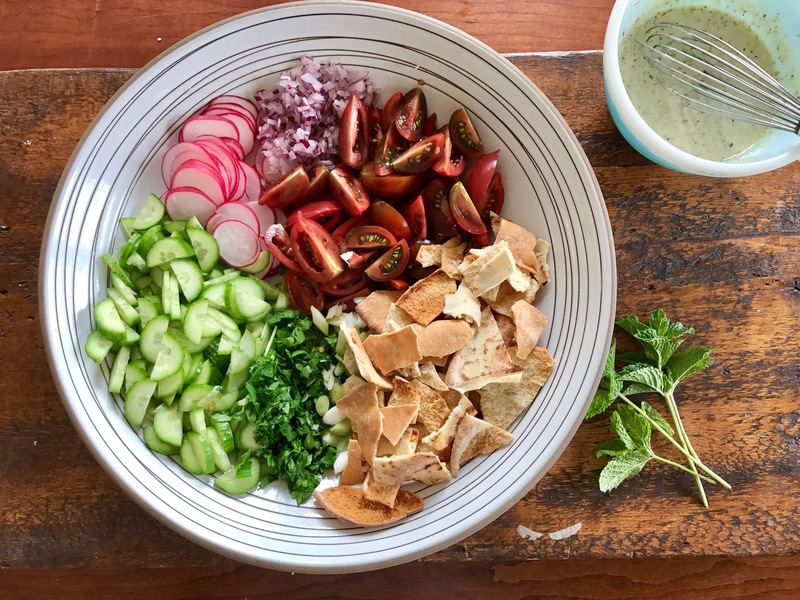 Look forward to trying this zippy salad over the weekend! Thanks for your meal inspirations! This looks delicious! I was wondering if you could suggest a non-dairy substitute for the yogurt in the dressing. Thanks! In lebanon we do only lemon juice, garlic, olive oil salt and pepper for this dressing. I can’t wait to try this yogurt version. I personally love all the variations in the US. I find the za’atar OR sumac instructions weird as they are different things and would give two quite different salads, esp if you were to use sumac in the quantities you might use za’atar – 2tsp seems a lot for this amt of veg, esp as you don’t have any greens. I am Lebanese and we only use sumac in this salad and yes we do use a lot of it so the measurements are correct! Wish I could ask you bring your salad to me as your sister 🙂 I feel lucky coz i don’t need send you email to have this recipe. Thanks for your sharing! This was dinner tonight with grilled chicken and it was incredible! I added feta cheese and red peppers, yum! Trying this salad tonight! Was hoping you could you post your horseradish mashed potato recipe? Thanks!